By controlling the voltage applied to the quadrupoles according to scan speed and m/z, the LCMS-8050 achieves superior ion transmission at any scan speed. 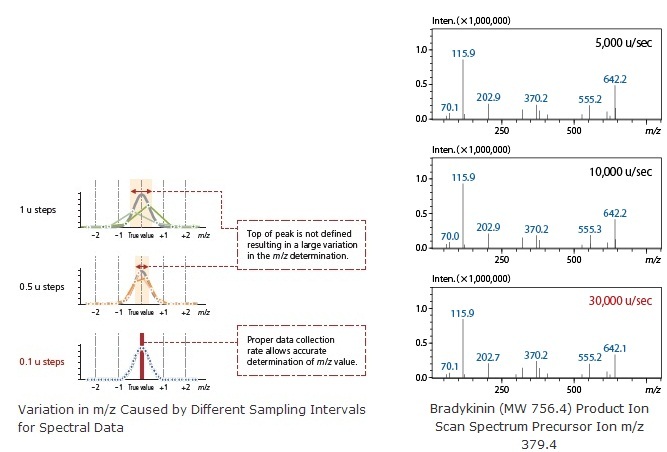 And because Shimadzu maintains data collection at 0.1 u intervals, high-quality mass spectra are obtained without loss of sensitivity or mass accuracy. The Synchronized Survey Scan (SSS) function allows MRM acquisition to be combined with a variety of other scan modes. It is extremely useful for obtaining more detailed qualitative information on components detected during multi-analyte quantitative acquisition. One thousand events can be registered within a single method. It allows setting of optimum collision energies for each component in order to obtain only the required qualitative information.